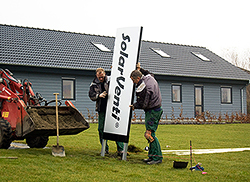 During normal operation, the solar air collector get started as soon as the sun shines. – The sun’s rays will generate electricity in the solar cell, which will then get the fan to run. 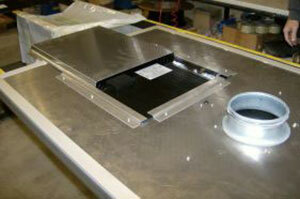 The fan will pull fresh air through the backboard and absorbe felt – inside the solar panel. The air will be warmed up and blown into the house. On hot summer days, you will not need extra heating. Here you can turn off the system and thanks to SolarVenti patented backboard, the collector is able to cool itself, so there is no overheating. SolarVenti is the only air collector on the market that can cope with passive cooling even under extremely sunny climates. Other models have an extra fan to it. For the use on hot summerdays you may add an extra fan blowing temperated air in from the shadow side of the house as show in the video. The SV20 is now manufactured with a solar cell placed in the backboard for several reasons.